Skunkworks client RDM Lawyers is one of several corporate sponsors of a competition being held to support the professional development of third and fourth year marketing students at the University of the Fraser Valley. The competition, entitled “The Intern 2”, is being run by The Abbotsford News in cooperation with UFV and the Abbotsford Sports and Entertainment Centre. 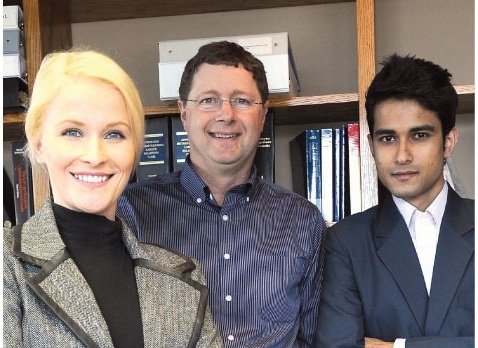 Team RDM Lawyers is comprised of the creative and capable dynamic duo, Laura Ullock and Abhishek (Yash) Chaurasia pictured below on either side of RDM Lawyers’ own Doug Lester. Laura and Yash are tasked with developing a marketing plan, supporting print ad and video piece designed to appeal to Millenials looking for legal advice on family law or personal injury law matters. Based on “The Apprentice” the competition is designed as an elimination vote i.e., the more votes a team gets the more likely they will be “fired”. While the results of each team’s marketing projects will not be posted until May 26, 2011, elimination voting started May 17 and will continue until June 13. Check out Team RDM Lawyers Facebook page. Find out more about how the contest works at The Intern Abbotsford. Good luck Laura and Yash and stay hired!